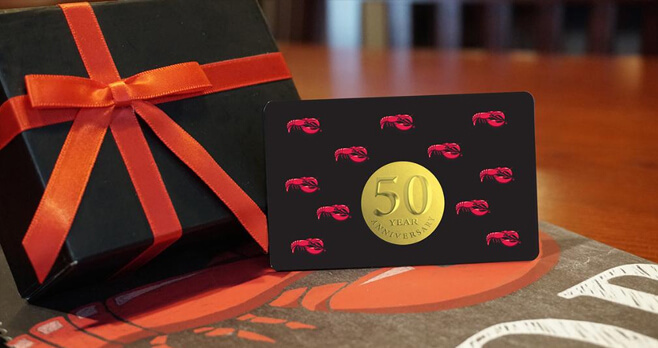 In celebration of its 50th anniversary, Red Lobster is offering you the chance to win Red Lobster for a year during the Golden Gift Card Sweepstakes. Share a photo of a Red Lobster memory on Twitter, Instagram or Facebook with #RLGoldenSweepstakes to win. Who Can Enter? The Red Lobster Golden Gift Card Sweepstakes is offered only to legal residents of the 50 United States, the District of Columbia, and Canada (excluding Quebec) who are at least 18 years of age or the age of majority in their place, province or territory of residence at the time of entry. When To Enter? Sweepstakes begins on January 18, 2018 at 12:00 AM ET and ends on February 8, 2018 at 11:59:59 PM ET. What Is The Golden Gift Card Sweepstakes Prize? The Grand Prize consists of free Red Lobster for one year awarded in the form of a $2,000 USD Red Lobster gift card. Who Are The Red Lobster Sweepstakes Winners? For a list of winners, interested individuals should mail a self-addressed stamped business envelope to: Winners List, – Red Lobster Golden Card Sweepstakes, P.O. Box 251328, West Bloomfield, MI 48325. Winner List requests must be received no later than April 9, 2018.